The Voices of the Vampire Community – better known as the VVC, has again added new members from South Africa to its membership. 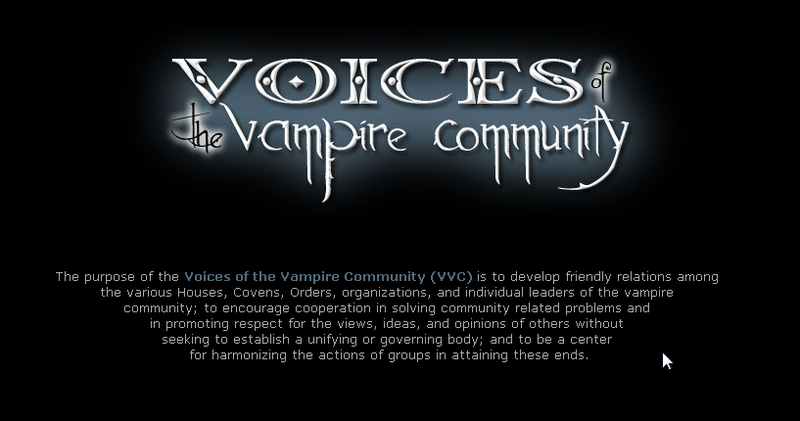 For those of you not familiar with the VVC, it is an organization created to provide educational information for the vampire community and those that are curious about our kind. It also serves to speak on behalf of the general community when occasion demands, such as when approached by the media etc. This organization works closely with media and sometimes liaises with law enforcement to dispel untrue stereotypes and maintain a fair outlook on real vampyrism. Founded in January 2006, it is still going strong almost a decade later, and boasts more than one hundred members from over 15 different countries, including well-known figures from various communities around the VC such as Merticus, Michelle Belanger – and our very own Octarine Valur, who was inducted into the VVC in February 2012. New members are admitted once annually, with the latest group of admissions – the “class of 2014”, numbering 15 notable individuals from around the world. Obtaining membership into the VVC is no trivial task, with membership being by invitation only – and nominees are required to possess noble and leader-like qualities as well as a verifiable and positive track-record in the VC. Only nominees who are of good character, are looked up to, and have earned the trust and confidence of the community are considered. All of these are qualities possessed by our friends, PSION VALUR DE NOCTE and KAY VALKIR NOCTEM, who have recently been formally invited to join the VVC. Both are Praetors to the Regency within SAVA. Together with Octarine Valur – the first, and currently the only other VVC member from South Africa – we have big hopes for Psion and Kay to take South Africa to new heights. This entry was posted on Tuesday, April 15th, 2014 at 7:50 am	and tagged with kay valkir, lunah eire, Octarine Valur, Psion Valur, SAVA, south africa, voices of the vampire community, vvc and posted in SA Community. You can follow any responses to this entry through the RSS 2.0 feed. I have noticed Vampyres coming out of the far east (Especially China) for a while now. I am surprised there are not more parts of Africa besides South Africa coming out of “the Coffin” & starting groups as well?? ?